$25 Worth of Chocolate for $12! It's About Time! 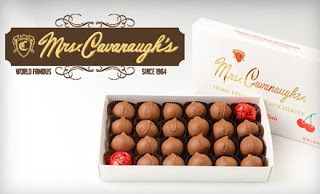 Today's Groupon is a $25 Gift Certificate for $12 to Mrs. Cavanaugh's! There are 5 Utah locations or you can redeem it online. Deal ends tonight and the certificate expires on 11/28/10. See details here. If your not in Utah, see your Groupon deal of the day here. Groupon is super easy to use. Once they have enough people in on the deal of the day (they have since I've been following) they will email you and you can print your Groupon or leave it safe in your account until your ready for it.